The Foodbank is in the running for a $15,000 grant for our community garden, and we need your help! Nature Path is awarding three grants to the top three highest voted for garden projects. If you could take a few moments to vote for us our team would really appreciate it! You can vote every 24 hours now through July 6th. Click here to take you to The Foodbank’s entry. UPDATE: Voting has closed! Thank you to everyone for your support! 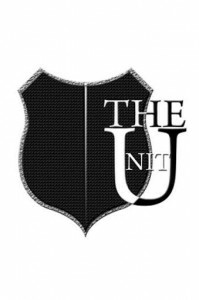 Started by Dayton based community-focused fitness group called The Unit, Dayton police will have the chance to build positive relationships with youth within the communities they protect and serve with Snack Back Our Streets. The Unit is collecting donations of food to create bags of snacks for officers to distribute to youth in the neighborhoods in which they work. Snack Back Our Streets is a program created through the identification of the need to strengthen the relationship between local Dayton police officers and the youth (13 & under) within the communities that they protect and serve. The community is encouraged to collect and donate healthy nonperishable snacks which will then be made into bags. Officers are then encouraged to distribute the bags to youth encountered in the community in hopes to engage a positive interaction that can later transition into a long-term relationship. Snack Back Our Streets will begin in Dayton Police’s 3rd and 5th Districts. To find a donation collection point, email daytontheunit@gmail.com or call (937)532-0169. Donations can include, but are not limited to, fruit snacks, granola bars, beef jerky, juice boxes etc. You can help single parents like Tim by donating to The Foodbank and making sure food stays on dinner tables of families who are struggling in the Miami Valley. The Foodbank, Inc. announced the release of the annual Map the Meal Gap study, which details the startling rate of food insecurity experienced by community members in Montgomery, Greene, and Preble counties. Map the Meal Gap 2015 reveals that food insecurity affects the most vulnerable populations in the Miami Valley, including 24.7 percent (41,230) of children. Food insecurity is the U.S. Department of Agriculture’s measure of lack of access at times to enough food for an active, healthy life for all household members. 130,200 Miami Valley residents report food insecurity in the results from Map the Meal Gap 2015; this is an increase of 4,500 more people from 2014. Additionally, 41,230 of those reporting food insecurity this year are children, which is an increase of 1,840 from last year. Map the Meal Gap 2015 is based on an analysis of statistics collected by the U.S. Department of Agriculture, U.S. Census Bureau, and the U.S. Bureau of Labor Statistics in 2013, the most recent year for which data is available. The study, commissioned by Feeding America, is a detailed analysis of the nation’s food insecurity. An interactive map is available that allows viewers to explore the issue of hunger in Dayton and across the country. The map can be found at map.feedingamerica.org. The study is supported by the Founding Sponsor Howard G. Buffett Foundation as well as the ConAgra Foods Foundation and Nielsen. The food price data and analysis was provided by Nielsen (NYSE: NLSN), a global provider of information and insights. The lead researcher is Dr. Craig Gundersen, professor of Agricultural and Consumer Economics at the University of Illinois, executive director of the National Soybean Research Laboratory and member of Feeding America’s Technical Advisory Group. County and congressional district food-insecurity details and the full report are available at map.feedingamerica.org. 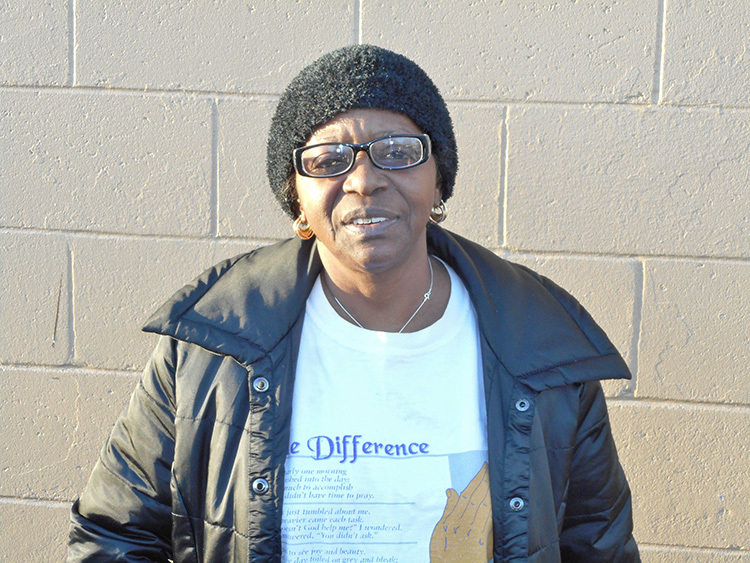 Individuals such as Jackie who benefit from the food they receive from the food pantry are very thankful. The food pantry provides them with encouragement and inspiration. The kindness they receive from those working in the pantry is seen on the smiling faces of those that volunteer to serve those in our community. Seniors aged 60 and over are particularly vulnerable to health implications of food security compared to other adult age groups. Your donations help ensure that elderly individuals such as Jackie don’t have to worry about not having food to eat. If you would like to make a donation to help feed people like Jackie, click here. Amy’s husband lost his job last May and she lost hers in October. While she has been able to find part-time work, her pay barely covers the family’s bills. Many months after paying the mortgage, electricity, and water bill there is nothing left to buy other necessities, like food. Many families, like Amy’s, rely on food pantries when times get tough. Amy is currently looking for a job as nursing assistant. She looks forward to the day when her family is able to get back on their feet and even give back as a volunteer at the food pantry. Until then, Amy knows she can rely on her local food pantry and The Foodbank to get the foods her family needs. 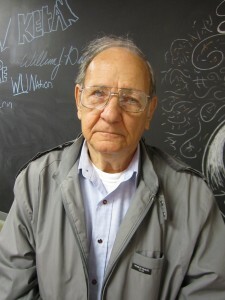 Don Allen, 79, is a dynamo. He works tirelessly for the Miamisburg Helping Hands Food Pantry which will celebrate its 50th anniversary this year. It’s one of 88 member agencies that The Foodbank supplies. “The Helping Hands Food Pantry is set up like a business. There are 16 board members, a President, a Vice-President, Food Distribution Manager and receptionists,” he explained. “12 churches throughout Miamisburg staff Helping Hands. Each church is assigned a once-a-year monthly responsibility to staff the pantry,” he added. He said that he has seen an increase in the number of families served by the pantry. “We serve an average of 325 families, but in November we had 360 families come in,” he stated. Helping Hands is open Monday from 6 – 8 pm, Wednesday and Friday from 2 – 4 pm. The pantry is also open on the last Saturday of the month from 10 – 12 pm. Yet, woodwork was just not enough to satisfy him. As a man used to being actively engaged in the world, he found restrictions bothersome. “I didn’t want to sit around. I wanted to have something to do,” he stated energetically. “I told a neighbor, Barbara Standifer who is now the pantry’s President, about my need to do more. She told me about The Foodbank and suggested that I visit Helping Hands to see what I could do. I did, and I have been there 3 ½ years,” he said as he grinned. “We work very, very diligently to folks in the Miamisburg community. “Working with everyone at The Foodbank is fantastic. I couldn’t ask for the opportunity to work with nicer people. They go above and beyond for us,” he said gratefully. It is a partnership that is sure to last for a very long time. Inspired by the holiday season, DPL Energy Resources wanted to find a creative way to say “thank you” to its customers. They decided to give back to their hometown community by sponsoring a matching campaign with us at The Foodbank. We have been a long-standing partner with DPL, and we were happy to partner with them to administer this campaign. Thanks to the generosity of DPL Energy Resources customers, and a matching donation from the company, we were able to raise $ 31,617 dollars, enough to deliver 126,468 meals for local families. DPL Energy Resources customers along with the general public were invited to donate money in support of The Foodbank and the 88 food pantries, soup kitchens, and shelters we serve in a tri-county area. DPL Energy Resources matched donations (up to a total of $10,000) from November 21 through December 15 of 2014. A $10 donation provided 80 meals to the hungry in Montgomery, Greene, and Preble counties. Over the years the face of hunger has changed. Families rely on their local pantries to put food on the table while parents work two or three part time jobs to pay the bills and keep a roof over their heads. DPL Energy Resources is Dayton’s hometown retail electric provider, serving the needs of 285,000 residential and commercial electricity customers in Ohio and Illinois. DPL Energy Resources has been providing customers with smart energy strategies and generation services at a competitive market-based cost since 2001. Learn more at dplenergy.com. Follow DPL Energy Resources on Twitter @DPL_Energy. The Xenia FISH Pantry began meeting emergency food needs in the wake of the 1974 Xenia tornado. Xenia FISH was founded by local Episcopal women and is sponsored by the Xenia Area Association of Churches. The FISH Pantry is a voluntary non-profit organization. After walking down the long hallway past other social service offices, the first things one encounters when walking into the doorway at Xenia FISH PANTRY are smiles and goodwill. The office staff and warehouse workers are genuinely pleased to be there to serve the people who are in need. Bare concrete floors, fluorescent lighting, rough wooden shelving and cramped office spaces make up the décor of the pantry, yet no one seems to mind or even notice. They have but one purpose in mind and that is to help others. Incoming Board President Bob Bosl is outgoing and passionate. He and Dan Frevert were eager to tell the story of the day-to-day operations of the pantry. Bosl was formerly the Manager of Human Resources at NCR for 33 years and has been involved with FISH PANTRY for twelve years. Dan Frevert, a twelve-year veteran of the organization, is another FISH PANTRY board member. He oversees the daily operations at the facility with patience and skill. Part of that job is teaching staff how to enter data in the computer that uses software specially designed for The Foodbank. His previous career was in the Division of Wildlife Management in the Bureau of Fish and Wildlife, where he retired after 33 years. Bosl stated that, “We service the Xenia area and Fairborn. We have about 40 families a day, approximately 200 people a week.” Their clients encompass people “from 1 year-old to 75 years-old,” according to Frevert. Save for fees paid to a certified public accountant who files income tax returns, all the workers are strictly volunteers and are paid “zero,” according to Bosl. The Greeneworks Employment and Training Center provides skilled workers in the warehouse and those doing the myriad of paperwork helps individuals get food stamps and help with heating along with job training. “One lady works 120 hours a month, and after about a year, they have to leave the program and get another job. We hate to see them go because they really learn to do the job. They gain basic skills,” he said. Clients are allowed to come in once every month. They show identification, but do not need to show other kinds of need qualification. Each person is treated with warmth and dignity when they arrive to register for their food allotment. Upon registering, each individual receives a number and waits patiently in the hall, to be called in for their selection of food. On Thursdays, a truck comes from The Foodbank and food is sorted and shelved according to type. There is a wide array of canned food, including vegetables, fruits, soups, pork and beans, and spaghetti sauce. The dry foods range from pasta, beans, raisins, milk, cereal, macaroni and cheese, biscuit mix, instant potatoes to peanut butter. Single-serving meals and protein rich food such as beef stew are very popular. Farmer donated fresh eggs and meat, such as chicken are valued by the clients as well, stated Frevert. Periodically bread and pastries are delivered from Kroger, which are a big hit. Clients receive bags that each contain a distribution of all the food groups on hand at the time. Monday through Friday the flow of goods in and out of the Xenia FISH PANTRY continues with the help of its small army of volunteers. Local people will always be on hand to help their neighbors in this small, but mighty organization. The need for food never ends and so the beat goes on.